Jinkee Pacquiao was never an unattractive woman. I’m even going to say she’s pretty, albeit not in that OMG-she’s-a-glittering-paragon-of-beauty kind of way. She’s not hard to look at at all, and she’s always had that moderately mestiza look going for her, something that a lot of people here tend to fawn over. As her husband went on to win numerous bouts and make a lot of money, it was no secret that Jinkee began to acquire quite a lot of jewelry and designer bags and clothing. Who can blame her? If you get the chance to make the kind of money the Pacquiaos are making, you’d be stuffing yourself silly with every material good you ever dreamed of having. Of course, along with the wealth, Manny is always reported to acquire some female hangers-on as well, which Jinkee is never ever happy about, the same way any wife would react. Still, showbiz observers note that Jinkee wouldn’t ever give up her life and her wealth despite Manny’s indiscretions, and channels her rage instead into shopping, managing the family business, and making herself gorgeous. That’s why over the past few years, it’s been quite safe to say that Jinkee has become a fashion icon for many, and she hasn’t been afraid to freshen up her look as well, something that people often say is part of her attempt to hang on to Manny and keep him from straying. Who knows if that’s the real reason, but it hasn’t escaped anybody’s notice that she’s been close chums with Vicki Belo and is one of the clinic’s endorsers. Unfortunately for Jinkee, whoever creates the Belo ads seems to take great pleasure in mangling her face, turning her into someone completely unrecognizable. Unless they read the captions, no one in his or her right mind would ever guess that the woman in those ads is Jinkee Pacquiao. After every ad came out, I looked up pictures of Jinkee at the time to see if she remotely resembled the woman in the ads. Of course she never did. She looked the way she always did, perhaps her face a little smoother and tighter than it was before. Still, those ads are nothing compared to Jinkee’s Mega cover. Now Photoshop is a permanent resident in the publishing world: blemishes are dealt with strictly using a healing brush, rolls of flab and loose skin are erased, ribcages are smoothed out, stray strands of hair are patted in place. Unshopped pictures are practically nonexistent, and everybody’s cool with that. 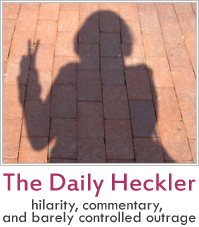 But you know you’ve gotten out of hand when there’s universal derision towards your magazine cover. Majority of the commenters on Mega Magazine’s Facebook page have complained that Jinkee is unrecognizable on the cover, with some mistaking her for either Agot Isidro or Kristine Hermosa. 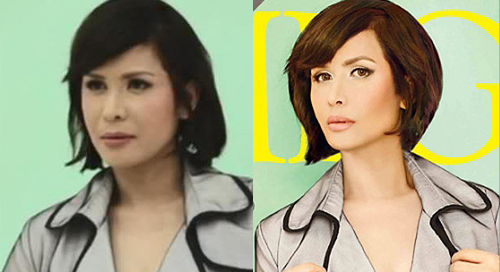 Others remark on the power of Belo and Photoshop. A small number has jumped to Jinkee’s defense, resorting to the all-time favorite: “Inggit lang kayo, maganda siya. Kayo siguro mga bitter at pangit” and other comments in the same vein. This isn’t about being envious of Jinkee’s wealth and beauty, however. What it is is outrage at the fact that the media seem to think that we don’t remember what a person really looks like and that we’re stupid enough to believe everything that is being presented to us. Everybody knows how Jinkee Pacquiao really looks, and she certainly looks nothing like the woman on the cover, even after any work she’s had done. Just search Jinkee Pacquiao on Getty Images and take a look at her face last month. Magazines usually work on an issue one or two months ahead of its release, so if Mega presents the cover as Jinkee’s real face, that’s what you should be seeing in the Getty pictures, which it isn’t. It would be so nice if Mega were just trolling the hell out of us and making a statement on how Photoshop is taken to ridiculous extremes, and then release a nice new cover. What baffles me now is why companies and publications are driven to completely alter Jinkee’s appearance and make her unrecognizable. Again, she’s not an ugly woman and it makes no sense for them to chop up and trim her features then claim she’s Jinkee, when a simple side-by-side comparison will immediately debunk that claim. Now if those photos were approved by Jinkee herself, then she’s not as fearless as she says she is in her ad if she prefers to hide her real face with the magic of Photoshop. Here’s a side-by-side comparison of Jinkee behind the scenes and her cover. I’d love to do one with her behind-the-scenes pic and her real actual face pre-surgery.